Travel in style in this convertible, classic 67 Mustang. This one hour joy ride for up to three people is the perfect way to see the sights of Sydney. When booking we only need details of one person. 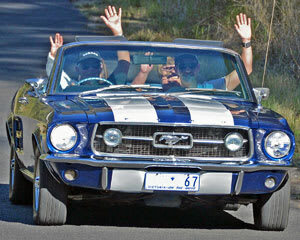 The 67 Mustang is a classic muscle car and a ride in this vintage, convertible Mustang is the perfect way to take in your favourite Sydney sights. With a 25 km radius from the CBD for pick-up and drop there are countless choices for your muscle car ride - you could begin in Bondi and cruise the Eastern Suburbs and beaches, motor over the Harbour Bridge to Manly, breeze through Bankstown or roar through Revesby you could even parade around Parramatta with the top down - it's up yo you. There are three passenger seats so you can bring along your two best mates to share the ride.